My Baby Buttons Make Pacifier Clips Fun and Personal! Colorful, fun, sweet or sassy – the buttons are as changeable as your baby. Embroidered buttons are covered in fabric and can be hand washed with cold water. The easy-to-use clip keeps pacifiers near your baby and off the floor. 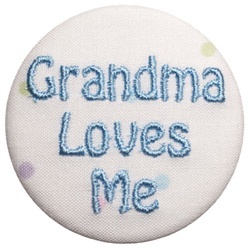 Great gift for Moms, Dads or Grandparents. Meets or exceeds all applicable U.S. safety standards. From the creator of GumDrop® & Soothie® pacifiers. Only the exclusive Velcro-backed My Baby Buttons clip attaches to the velcro-backed buttons. Works with all standard pacifiers, including GumDrop & Soothie! 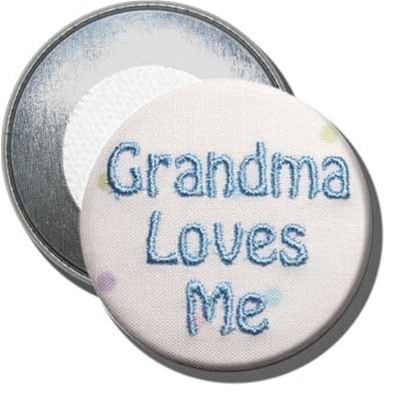 Button size: 2.25 inch diameter. This product is recommmended for all ages and meets U.S.A. safety regulations. This product is not a toy. Conforms to CA AB 1108. Assembled in the U.S.A. by Sandbox Medical LLC. Components manufactured in China.